Police in Revere started pursuing a suspect for a robbery around 1 p.m., and it appears the suspect abandoned his car near the Suffolk County Jail on Nashua Street in Boston, according to state police. Authorities say a bank robbery suspect whom police in Revere, Massachusetts, had pursued was taken into police custody near Boston's TD Garden Wednesday. Woburn resident Steven Spolidoro, 41, is accused of robbing an East Boston Savings Bank on Squire Road around 1 p.m. He allegedly passed a note demanding money and made off with $1,000 in a vehicle with New Hampshire registration plates. Police say he did not use a weapon. Police in Revere started pursuing Spolidoro and said he abandoned his car near the Suffolk County Jail on Nashua Street in Boston, according to state police. State police say the suspect, whose name has not been released, was in custody near the TD Garden. Spolidoro was eventually found under an Interstate 93 ramp, state police said. Officers recovered the money but say the dye pack inside the bag exploded. 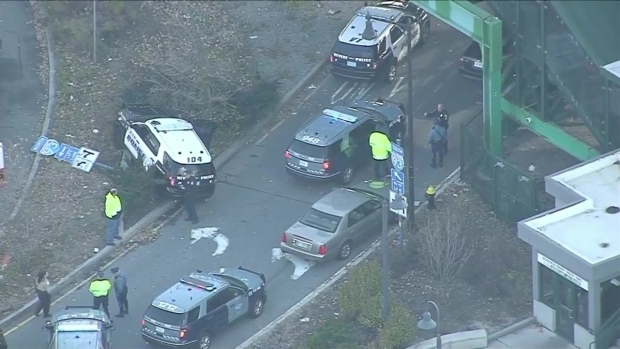 Sky Ranger footage showed a major police presence at the Science Park/West End station on the MBTA's Green Line, with multiple state and local police vehicles around a taupe sedan. A Revere police cruiser appears to have jumped a curb and knocked down a street sign. An officer suffered a small cut to his hand, but will be alright. The MBTA warned riders of minor delays due to earlier police activity at North Station. Police say Spolidoro may be connected to other bank robberies in the area. It's not clear when Spolidoro will appear in court or if he has an attorney.